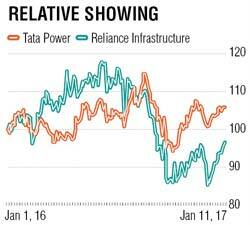 Reliance Infrastructure (Rel Infra) and Tata Power Company (TPC), the two private discoms supplying electricity to Mumbai, may face a probe by the Maharashtra electricity regulator. The state government is planning to invoke its powers and issue directives to the power regulator for a probe on the two private discoms after the proposed audit by Comptroller and Auditor General (CAG) audit is yet to bear fruit. The Maharashtra government had written to the CAG for auditing the two firms, but officials said they were awaiting a reply. Sources attributed the delay to legal issues involved in the CAG, a statutory auditor, examining the accounts of private entities in which the government holds no equity. "We had written to the CAG seeking their opinion and had also sent a reminder. But we are yet to hear from them," said a senior energy department official. During last year's monsoon session of the legislature, the state energy minister Chandrashekhar Bavankule announced that the state would issue instructions for a CAG audit of Rel Infra and TPC. This followed BJP MLA Ashish Shelar's charge that the two discoms inflated their electricity tariffs by showing higher capital costs. Bipin Shrimali, principal secretary, energy, told DNA Money that they had written to the CAG for the audit. "We had asked for their concurrence and issues to be taken up," said Shrimali, adding that they were awaiting a reply. When contacted, spokespersons of TPC and Rel Infra declined to comment. Bavankule said he had called for a meeting in this regard on January 17. An official said if the CAG audit could not be conducted, they would invoke their powers under Section 108 of the Electricity Act, 2003, and issue directions to the Maharashtra Electricity Regulatory Commission (MERC). The section says that "In the discharge of its functions, the State Commission shall be guided by such directions in matters of policy involving public interest as the State Government may give to it in writing." "This is an issue involving public interest. We may suggest a technical and financial audit," he said. Mumbai is serviced by four distribution utilities, the other two being Maharashtra State Electricity Distribution Company Limited (MahaVitaran), and Brihanmumbai Electric Supply & Transport Undertaking (BEST), which charge differential tariffs. The state energy department officials pointed to how the Delhi High Court in 2015 struck down the decision of the Aam Aadmi Party (AAP) government in Delhi to get the accounts of three private power discoms (Tata Power Delhi Distribution, BSES Rajdhani and BSES Yamuna) audited by the CAG. This was challenged by the Delhi government in the Supreme Court. In 2009, the state government had directed the regulator to investigate if Rel Infra had "discharged its duties as envisaged in the Act in the most economical and efficient manner so as not to result in unnecessary and avoidable burden on the consumers of its area..."
The MERC asked the Administrative Staff College of India (ASCI) to investigate Rel Infra in three broad areas: power purchase cost, capital investment; and, expenses of regulated business vis-à-vis other business. The ASCI probe said the capital investment was "commensurate with demand growth and other requirements for improving the system performance and reliability and it cannot be said it is an over investment." "The physical vouchers are verified for substantial transactions and they do not indicate any discrepancy with Books of Accounts," the report said.